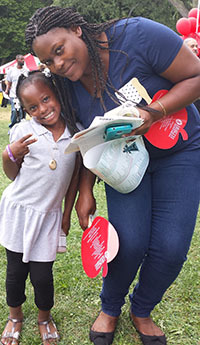 Among the thousands of parents and students who descended on John Ball Park recently were Alicia Allen and her daughter, Laticia. 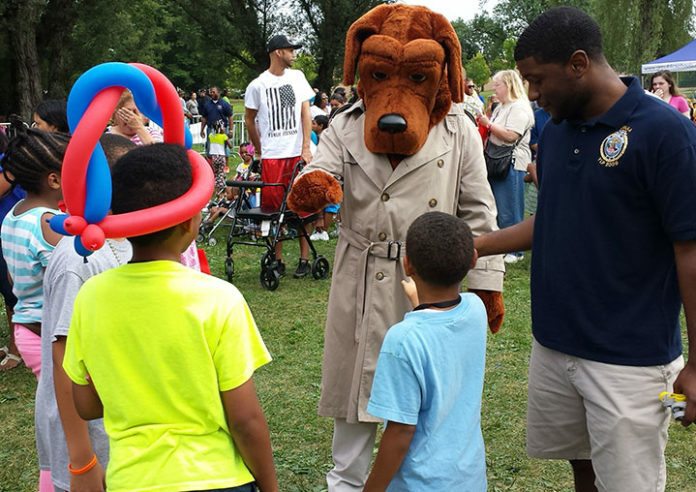 They came to the Grand Rapids Public Schools’ Back to School Celebration to get information about Southwest Community Campus, where Laticia will be a first-grader this fall in the English/Spanish dual immersion program. Allen said her goal for this year is that Laticia learns to read in both languages. “We’ve been practicing throughout the summer,” Allen said. “She’s been doing good, but that Spanish is not quite there yet. I’m definitely depending on the school to help me out,” she added with a laugh. Laticia seemed to take that as a challenge. First, she said “hola” (hello) and “como estas?” (how are you?) to a visitor, using what she learned last year in kindergarten. Then she started counting in Spanish, “uno, dos, tres …” and kept on going. “You see why I’m smiling?” her mom said proudly. Staff from Southwest Community passed out information from a tent, as did many other GRPS schools. There were booths for athletics, safety and health. School uniforms were on sale. Students played bean-bag toss and other games as they waited in line. Twisty balloon hats were popular items. Families dined while students played instruments and answered brain teasers from a nearby stage. With school opening Sept. 8, and summer swimming and camp just about over, the park was abuzz with activity and anticipation. Laura Grahs and her daughter Aliyah were excited about her going into first grade at C.A. Frost Environmental Science Academy, where students study rocks and go camping while learning academics. Blandford Nature Center and the West Michigan Environmental Action Council are community partners. Grahs said that in Aliyah’s kindergarten year, she liked all the environmental activities as well as the school’s heavy parent involvement and strong academics. Her hopes for Aliyah this year are to work on reading, be in a safe environment and get involved with all the school has to offer. Over by the stage, David Dorr listened to a student strings group with his son Oscar Peck-Dorr, a C.A. Frost grad who’s entering sixth grade at Blandford School. The frog ponds and woodlands of Blandford Nature Center will be his outdoor classroom, where he will raise chickens and tap maple syrup. The family considered Zoo School, the Center for Economicology and the new Museum School before settling on Blandford. “I call it a bounty of riches, which I think other districts should be envious of,” Dorr said.